Big weather changes are still coming as we end the week and head into the weekend with an arctic cold front on the way to the ArkLaTex. Rain and storm chances pick up Friday evening into Saturday morning. Much colder air will settle in on Saturday and continue through early next week. Skies will stay cloudy overnight. A weak weather system passing by will bring a few light rain showers through Thursday morning. Lows tonight will be in the upper 40s to low 50s. Any chance for rain will end by late tomorrow morning. Some sunshine will make an appearance for the afternoon. Highs will warm into the mid to upper 60s. More clouds are back Friday with a few showers or storms possible by afternoon. Temperatures will warm to near 70. Rain and storms will pick up in coverage Friday evening into Friday night. A few strong storms are possible, but widespread severe weather is not expected. Rain and storms will continue into Saturday morning but should be moving out during the afternoon as much colder air moves in. Some lingering moisture around the I-30 corridor during the afternoon could come down as some light snow. Right now no accumulations are expected. 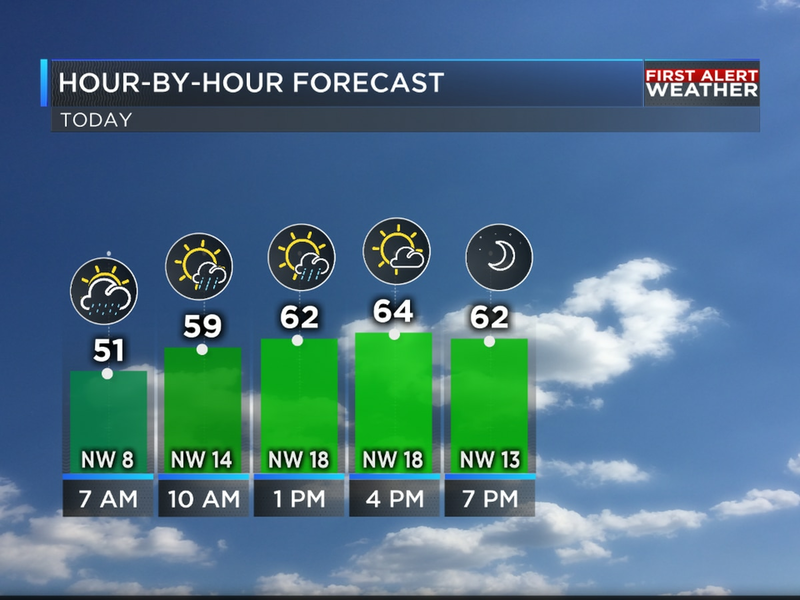 Temperatures will plunge during the day as a strong north wind kicks in. We’ll fall from the upper 50s in the morning into the 30s and 40s by afternoon. Skies will clear by Sunday morning with temperatures in the mid to upper 20s. We’ll be sunny but cold through the afternoon with highs around 40. Monday will be chilly, but sunny and dry. Morning temperatures in the 20s will warm into the 40s by afternoon. Rain chances are back again by Tuesday.